How Do I Add A User To My Account? Log in to the platform, and hover your cursor over your business name in the top righthand corner. Click the "My Profile" button to go to your settings page. 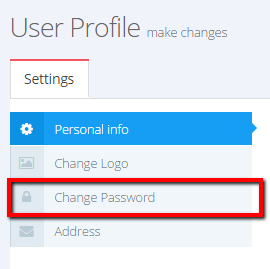 Click on the "Change Password" tab as shown above. Enter your old password, and your new password twice. Click submit.